I was asked by artist and teacher Dave Higgins to sit in on one of his classes at the local community college last week, to critique an assignment he had given his students. It was a class that focused on creating digital graphics and animations using primarily Photoshop. The assignment was to make a graphic based upon one of two subjects. One choice was to select any sign of the zodiac and the other was based on the term red tree. For red tree, he gave the students no indication of my work , just the phrase. This was an entry level course but the work was wonderfully creative. Of course, being a class of mainly 18 and 19 year-olds, there was a fair amount of angst and morbidity expressed in images of death and plenty of blood. But the work was great. I could find something of value in each student’s work, something that showed a real spark of imagination and inspiration. One of the students who has chose red tree had a simple composition of a weeping willow (that weeped blood!) set on a mound. Very simple but well done. 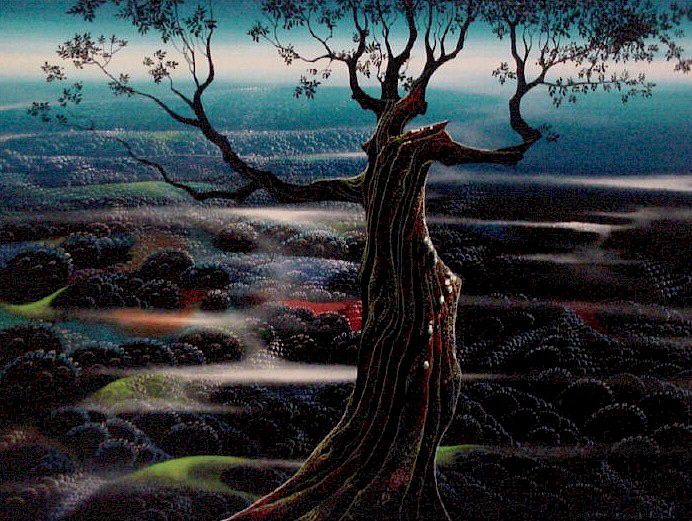 The color of the mound set against the silhouette of the willow immediately reminded me of the work of Eyvind Earle. Earle was an artist/illustrator who died in 2000 at age 84. He was a child prodigy and had his first one man show at age 14 . He exhibited his work in shows for many years but gained fame through his stylized Christmas cards throught the years and with his time spent working with Walt Disney in the 50’s and 60’s as a background artist. He was responsible for the look of many of the animated films of that time from Disney, including the classic Sleeping Beauty. Shown here is some of Earle’s work from that film. I came across his work about the time of his death, seeing ads in framing magazines for prints of his highly stylized paintings. There was something very familiar and attractive in the work and upon reading his bio I saw the connection between this recognition and his work from having absorbed it in as the settings and backgrounds for many Disney animations I had seen as a kid. It was very attractive work, very much of the graphic rather than painterly variety. Strong colors and great and unusual juxtapositions of compositional elements. Tree limbs extending into the picture like an arm reaching into the center of the image. Very evocative as well. It was easy to see how it was so successful in setting the tone for the action that ran across it in the Disney films and how something like it could have subliminally influenced a young student, or me, over the years. Here’s a short animation that highlights more of Earle’s work. I believe this is Russian-made so excuse the error in the title as they switched the names around making him Earle Eyvind instead. 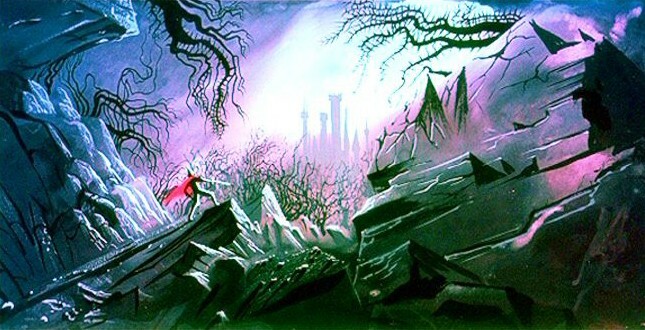 I think you’ll feel that same familarity even though you may never had heard the name Eyvind Earle. You can clearly see the Japanese influence in his work. Yes, it does have a Japanese feel. It’s interesting how the post-Impressionists were influenced by the woodblocks and paintings of Japan and in turn influenced the American Modernists who were obviously an influence on Earle. He then, through his work in animation, influenced a new generation of artists, among them the Japanese artists who produce anime today. Full circle.